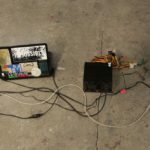 During the residence period Oscar Martin will be working on a new prototype of the installation BSM/NHC bionic sound machine – non human composer. Read more about it here. The start point of the installation it is to create a bio artificial ecosystem that evolved symbiotically, generating a non-human sound composer. 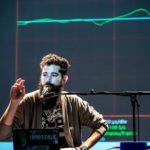 The bio machine proposes an alliance between “intelligence” of a different nature, a chimeric device consisting of a biological pseudo intelligence (Physarum polycephalum) and an artificial pseudo-intelligence based on genetic algorithms. 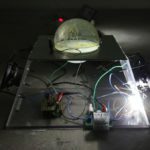 In a situation of exchange and mutual influence in their evolution the bio machine allow to discover new emergent behaviours perceptible through lights patterns,sounds and their organization in time.